What I liked: If I told you before I was 10% into this book, I knew what was going on and yet I still kept reading, you might wonder why. Well, the truth is, I KNEW some of the plot very early and I was intrigued enough to see how Mr McDonald was going to make a whole book as of the story line. He more than surprised me; he kept me reading until I was finished. The characters were pretty well defined and didn't need to grow so much as to react to what was going on around them and how they would handle each clue or try to catch the traitor. Mr McDonald was also talented and smart enough to show how even after all this time since 911, the intelligence departments still are not working together or sharing all the info they have with each other. (That's a bit scary but with politics and governments, totally believable). Frankie (Aisha Franks) thought she knew her lover, Nick Geller. Boy, was she ever surprised when he tries to kill the President of the United States especially with her on duty as part of the President's Secret Service detail. And there it starts and expands to America under attack on two different fronts. 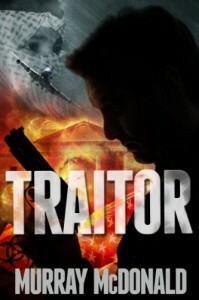 Part of Traitor is told from the traitor's point of view which worked the plot very well. Nick has been trained by the best and he's sharing that training with the radical Muslim community to bring America to its knees. The mystery is, can Frankie put together enough clues about the man she thought she knew to help capture and/or kill him before his plan is put into motion. While Frankie and Nick are two of the main characters, I especially enjoyed how the President was portrayed and the mystery surrounding Harry Carson. He seems to have a lot of intelligence and assets at his finger tips and yet, has no "official" government title. What I didn't like: Some parts of Traitor seemed to me to just be "fluff" to fill the pages but it was interesting fluff. A few of Mr McDonald's metaphors or word usage felt too glib. It was a bit over the top in a few places but put it all together and it worked to keep me reading. An enjoyable read with a plot I wish the real world could use.